Lately I have been trying to be more organized about updates to my libraries: I always try to keep the master branch on Github in a consistent state for all of them, and merge the development branches for all libraries at the same time. I have been doing that yesterday, here is a brief summary of the changes. cl-num-utils mostly received minor fixes: I cleaned up the accumulator code a bit, and added a few minor convenience functions. The package now exports median, which causes a symbol conflict with alexandria:median so you need to shadow if you are using both. Maybe I should ask the developers of Alexandria to make mean, variance and median generic. LLA underwent a medium-scale rewrite: I sanitized the type system (internal types are no longer exposed), cleaned up object creation functions (CLO replaced with HERMITIAN, LOWER, etc), and wrote specialized routines for array sharing which are about 30 times faster than they used to be — this of course doesn't mean that LLA is now 30x faster, just that they overhead for sharing arrays got a lot smaller. 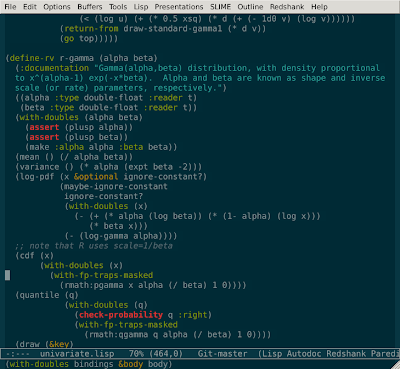 Since many operations are \(O(n^\alpha), \alpha \geq 2\), this is mostly noticeable for small arrays. Note that this is still generic CFFI-based code, preliminary tests indicate that implementation-specific tricks could yield array copying code that is 2-5x faster, but currently I have neither the time nor the inclination to write this, because I would rather wait for other parts of LLA to settle down before I micro-optimize. However, if you find that array copying overhead is critical for you, please let me know and I will see what I can do — this rewrite was prompted by the benchmarks sent by Robert Brown. Realizing that implementing special functions in Common Lisp is perhaps not the best use of my time, I decided to use a foreign library for this purpose in cl-random. I chose R's standalone math library, with an SWIG-generated wrapper (it took about 30 minutes to have this library running, SWIG is amazing). I made the result available as a small standalone library called cl-rmath in case anyone else wants to use it. I really appreciate that the R developers made this available as a standalone library, it makes my life much easier. Besides these changes, I only made small changes to cl-random, for example, the univariate normal now has the syntax (r-normal mean variance) instead of the standard deviation, to be more consistent with the multivariate case. Finally, it looks like cl-2d refuses to die, so I fixed some of the minor bugs that were the result of other libraries moving on. I am working on a replacement library, but I will probably keep cl-2d updated until the new library is ready. It amazes me how many people are using cl-2d: I get questions and bug reports all the time. It is not a bad library, but I wrote it when I was a CL newbie and I hope that I can write a much better one — we shall see. In any case, if you are not using cl-2d, I would recommend that you don't start now.